Rating: Rated R for language including some sexual references, and brief drug use. Synopsis: In Los Angeles, a new cult has appeared led by a woman named Maggie (Marling) who claims to be from the future. A young couple, Peter (Denham) and Lorna (Vicius), join the cult in an effort to infiltrate it and make a documentary exposing Maggie for being a fraud. The deeper they're pulled into the cult, though, the bigger the question becomes of whether Maggie is who she says she is. Andrew: Hello readers! 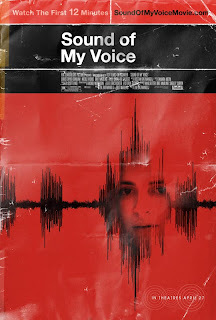 This afternoon Sarah and I made our way to a different theatre than our usual haunt to catch a matinee of a smaller film we have been looking forward to seeing – Sound of My Voice. We saw the trailer for this film a month or so ago and it completely caught our attention because of the premise, and when we found out it was playing in a theatre in Hartford, we just had to see it. Sarah, the most prevalent thought in my head during the entire movie was that I was glad we had little to no knowledge of what it was going to be about ahead of time, and the entire time I had no idea where the film was going and that was a good thing. Would you agree or disagree with me on that? Sarah: I would agree. I would have to say that, while it bothered me at times that it didn’t seem to go in a specific direction, that that was the point of the movie. A: Yeah, I know what you mean by saying it didn’t seem to be going in one specific direction. The movie had what looked like three different threads and for a while there you really had no idea how they were going to end up connected. But by the end of it, I felt the film pulled all three strings together quite nicely even if the ending was a bit ambiguous. S: This movie surprised me a little bit. The way that the characters interacted was not what I was expecting from a movie about a cult. They didn’t come off as crazy. So remembered when we first saw the trailer, I was skeptical about what it was going to be about. Was it going to be about this couple infiltrating this cult or something more? Was it going to play in a predictable fashion? And it did not play out in a predictable fashion. I never quite knew where I stood with this movie. A: Exactly. I found that the filmmaker, Zal Batmanglij, did a fantastic job keeping us on our toes the entirety of the film. It is a VERY slow paced movie, so it might not be for everybody, but the events in the film play out in a very deliberate pace and I think that’s something some films don’t do well. That’s not the case here. With the different threads, I didn’t know where it was all going to end up. With the main characters, Peter and Lorna, I didn’t know what their fate was going to be. And with Maggie, even at the end I have no idea whether she was legit or not. And for me personally, I found that to be refreshing. S: I actually think that, while it WAS slow, it weren’t any dull parts. It all moved toward a very deliberate place, but in my opinion, to a place we never fully got to. Which, in a way, was quietly beautiful! It was probably one of the best-written movies I’ve seen since Chronicle. It was very strongly an independent film and one that I would hope does as well, to whatever extent, that Chronicle did. 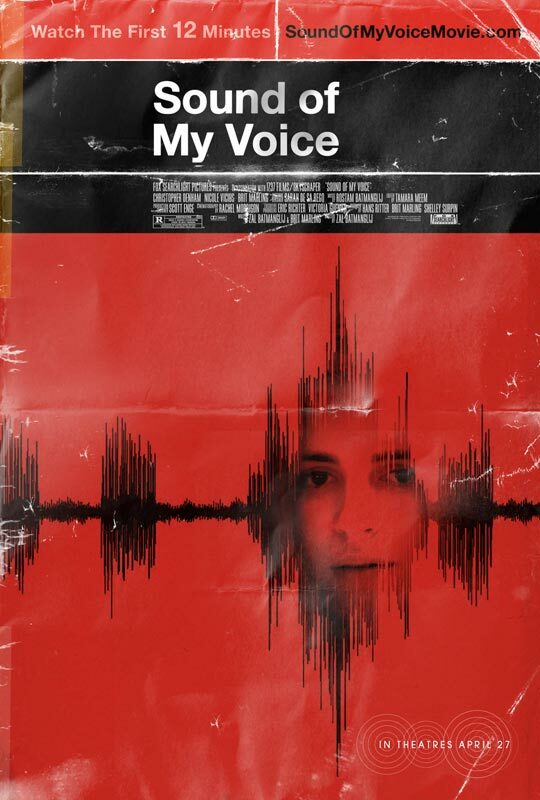 A: I find it interesting that you compare Sound of My Voice with Chronicle, because they’re both science fiction movies done with a smaller budget and from different kinds of point-of-view storytelling. I think that’s a good comparison. The two movies are about different things (one is about a woman who claims to be from the future, the other about kids who gain superpowers) and while they’re both low-budget I think that makes both of them stronger character-wise. I was more invested in Peter and Lorna and the depths they go to with this cult than I have been with most movies this year. I don’t know if you noticed, but whenever another character was talked about, it was never in their own voice. It was always done by somebody else. A: What do you mean exactly? S: Well just that when we hear about Peter’s backstory, it’s voiced over by Lorna. And vice versa. So we never really got to hear how the characters felt about their own histories. Or how that shaped them to be the way that they are at the beginning of the movie. A: That’s good point, and one of the many things I liked about the movie. In the same vein, I liked that we always saw the cult from Peter and Lorna’s perspective, both individually and as a couple. We saw the effects it started to have on them in a very personal way, helped by a few choice scenes that were very intense. I honestly can’t think of many negative things to say about Sound of My Voice other than I do sort of wish we got a resolution to the story. But at the same time, as I said earlier, I found it refreshing that it was left ambiguous and up for interpretation. S: And I would have to say that when the movie ended I went “Hey wait? What happens?” And I think that’s what the filmmakers were going for and they exceeded perfectly. So do you need to go see this movie in theatres? Not necessarily. But if you have a hankering for an independent movie that’s entertaining, this would be one to see. A: I half agree with you there, because I do think people should see this in theatres simply so Batmanglij can make his possible sequel! I still kinda want to know how the rest of the story goes!